(Nanowerk News) Fuel economy of all new vehicles sold in the United States is at its highest level ever, according to UMTRI researchers. Average fuel economy (window-sticker values) of cars, light trucks, minivans, and SUVs purchased in October was 24.1 mpg, up from 23.8 in September. The mark sets a new record and is a 20 percent increase (4.0 mpg) from October 2007, the first month of monitoring by UMTRI research professor Michael Sivak and colleague Brandon Schoettle. 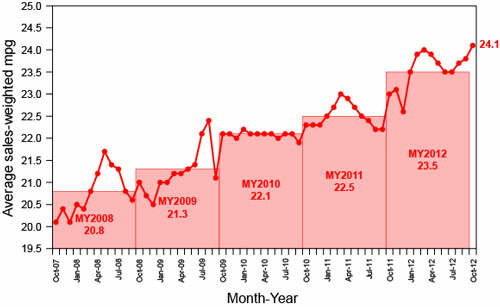 Average sales-weighted fuel economy of purchased new vehicles for October 2007 through October 2012. "The improvement in fuel economy in the past five years corresponds to a 17 percent reduction in fuel consumption per distance driven," Sivak said. In addition to average fuel economy, Sivak and Schoettle issued their monthly update of their national Eco-Driving Index, which estimates the average monthly emissions generated by an individual U.S. driver. The EDI takes into account both vehicle fuel economy and distance driven--the latter relying on data that are published with a two-month lag. During August, the EDI remained unchanged at 0.81 (the lower the value, the better). The index currently shows that emissions of greenhouse gases per driver of newly purchased vehicles are down 19 percent, overall, since October 2007.